With the growth of our hobby over the last few years, people are starting to look at playing with toy blasters a bit differently. Where the basic idea used to be plinking around the house with friends and generally just goofing off with blasters, there are now large, well-organized Nerf battles all over the country. With those larger games come more organized game types like king of the hill, capture the flag, flux, and many more that I look forward to showing all of you in the future. While there’s absolutely nothing wrong with goofing around at home with Nerf blasters (I know I still do), there’s another level of fun added when you get a large group of people together for a game and you work toward a common objective. 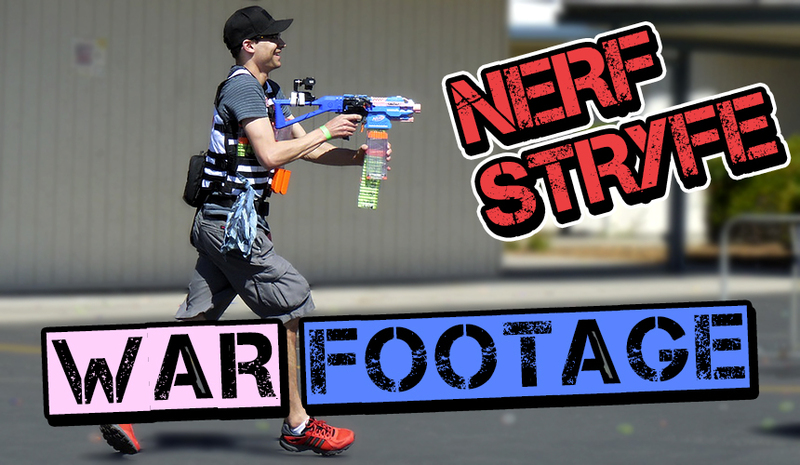 In this first article from my Nerf war footage series, we’ll explore the concept of teamwork on the battlefield. 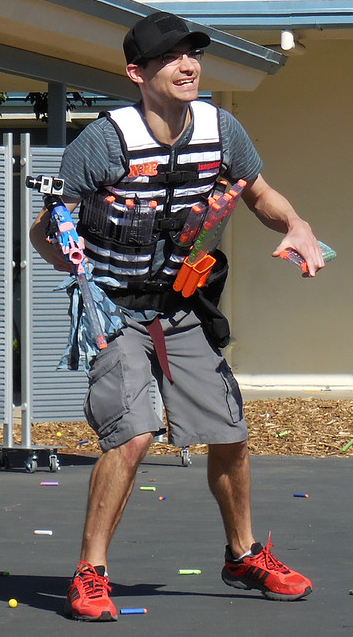 The foundation of teamwork in a Nerf battle is communication between players, which leads to cooperation. That cooperation can be the deciding factor in a game, which is why I’ve chosen the video below to share with you first. We’re playing a game type called “payload,” where each team takes a turn moving an objective (in this case, one of the moderators), from one side of the field to the other. The team that gets the objective the furthest, or pushes it to the other side of the field fastest, wins. In the video, our team is on defense after already finishing our attacking side, where we were unable to move the objective to the end of the field–meaning we now have to prevent the other team from getting further than we did. To make things a little harder, our team was outnumbered, and there was a disparity in blasters between our team and the other. We had a high number of players running Hammershots or other front-loading, low capacity, slow-firing blasters, while the other team was running more flywheels and other higher-capacity or powered blasters. This series of disadvantages brings me back to why I love seeing teamwork and cooperation on the field. You’ll see towards the end of the video how our team sets up a bubble around the objective, where we’re constantly yelling to each other what’s going on and what we see, so we can always react accordingly. It made the game feel balanced and intense, showing that the players themselves are just as important as the blasters they choose, resulting in a very close, very fun game at the end. Before I leave you with the video, I do want to discuss the loadout I was running for this game. I had the heaviest loadout on our team, a modded Stryfe, which internally has a BlasterTECH stage 3 Falcon kit, running off a 3S LiPo battery. On my body I’ve got a BlasterSmiths UK molle vest, which has four built in mag pouches. On top of those, I have two double stack Narrowbase mag holders. However, only three of those slots are filled because B.U.R.N. (Bay area Urban Recreational Nerf) has a 144 dart limit for this game type, which equates to eight total eighteen dart mags. So I have seven on my body, and one in my blaster. Now let’s get to the real reason you’re here, the video! Thanks for reading, and I’ll see you next month! This entry was posted in Game Reports and tagged Event, Gameplay, hasbro, mod, nerf, Nerf War, Report, stryfe, Video on August 26, 2016 by Jangular.